Another sparkling slab of history as high drama from powerhouse journalist (The Best and the Brightest, The Powers that Be) Halberstam. Here the Pulitzer-prize winner focuses on the head-on collision in the 1970's between Ford and Nissan, seeing in the consequent transfer of economic power from West to East the inevitable result of American hubris. The gripping narrative opens in 1973 Detroit with energy expert Charlie Maxwell's warnings of an incipient oil crunch falling on ears deafened by overdoses of power and money. That Ford failed to heed Maxwell is no surprise to Halberstam, whose exhaustive research reveals an industrial giant held hostage to the raging ambitions of generations of owners and managers. If there is a villain to this tale, it's Henry Ford himself, not the genius who invented the assembly line but the aging autocrat who let his company slide into such shambles that for years bills literally were totalled by measuring the height of the stacks of slips on which they were written. Also receiving Halberstam's scrutiny in a series of brilliant and often devastating portraits are Henry Ford II, Robert McNamara, Walter Reuther, and Lee Iacocca (who here loses much of his heroic luster). Interwoven with this tale of greed and pride is the very different story of Nissan, a story of men (and this book is about men, solely) less devoted to ambition than to honor. If there is a hero to this tale, it's the dominant Japanese ethos, which fused Nissan's management and workers into a cohesive unit at the same time that Ford's staff squandered its energies in internecine squabbling. 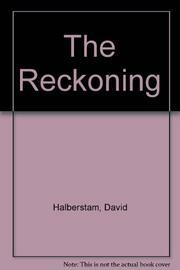 Halberstam worked on this book for five years. An impressive investment with a rich return: this is first-class journalism all the way.